A group of stunt men (and women) on a Power Rangers-style sentai show leave to form their own studio, and make their own show. Along the way, they’ll fight numerous monsters of the week, craft better costumes out of duct tape, cardboard, and dreams, and, of course, learn the value of friendship. 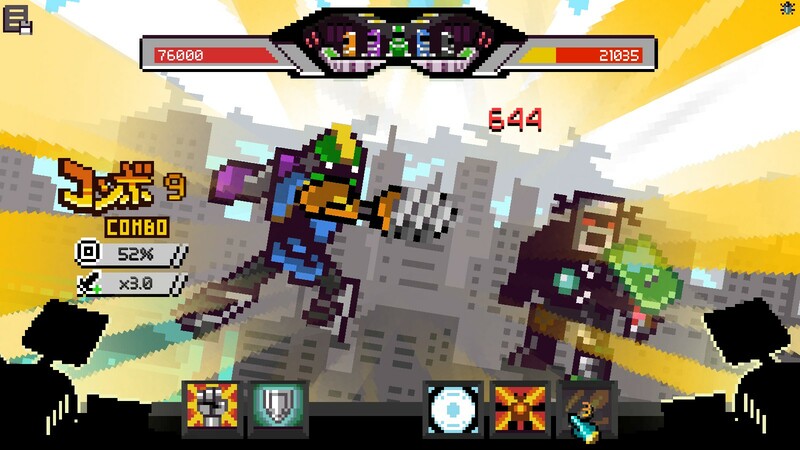 The primary gameplay consists of tactical RPG battles mixed with turn-based giant mecha showdowns, supported by crafting and resource management. 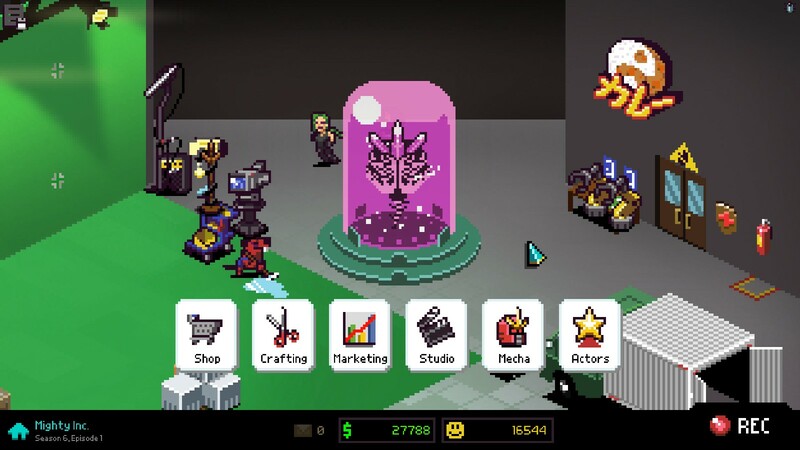 From the moment I saw Chroma Squad appear on Steam, I knew I was in for something special. 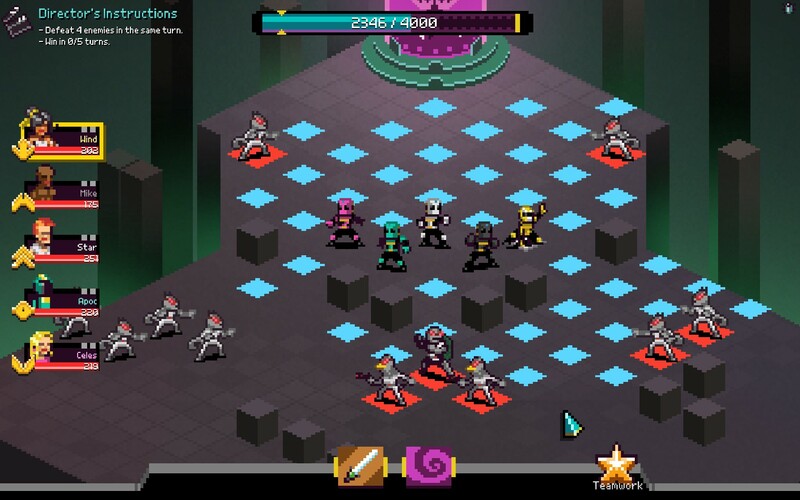 Once I learned it was a sentai-style tactical RPG, I was sold. The game is a ton of fun to play, and its various elements (crafting, battle, money management) are in excellent harmony. It also doesn’t hurt that the music is varied and enjoyable, the retro graphics are charming, and the plot is solid, if short. 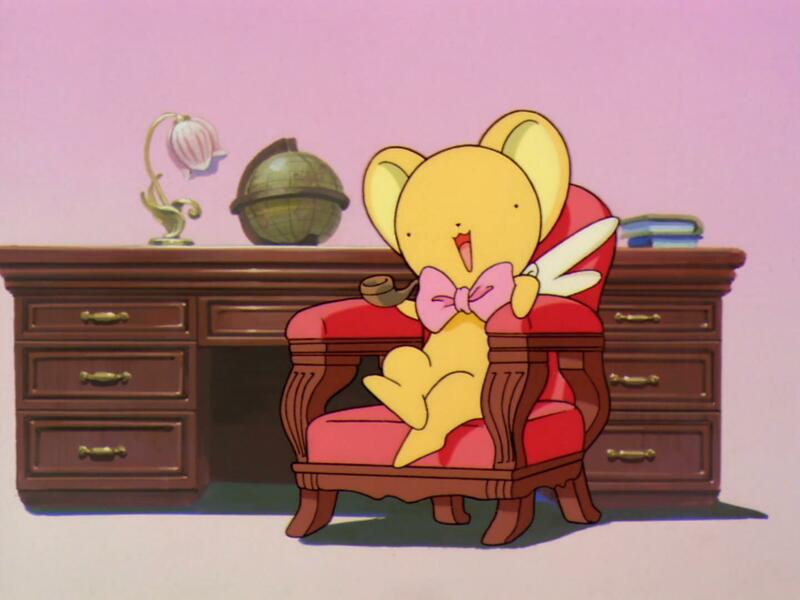 It’s also full of both straight humor and many references/homages to the genre, most of which I admit flew right by me. The game splits its time evenly between management and battles. From your base of operations in an old warehouse, you prepare your squad for combat. Why yes, our team’s mentor is a giant brain in a jar. Best prop ever! They are, naturally, five individuals, each with their own role on the team. …while for others it will decide how the character will function on the battlefield. Turn your healer into a death machine. For great justice! 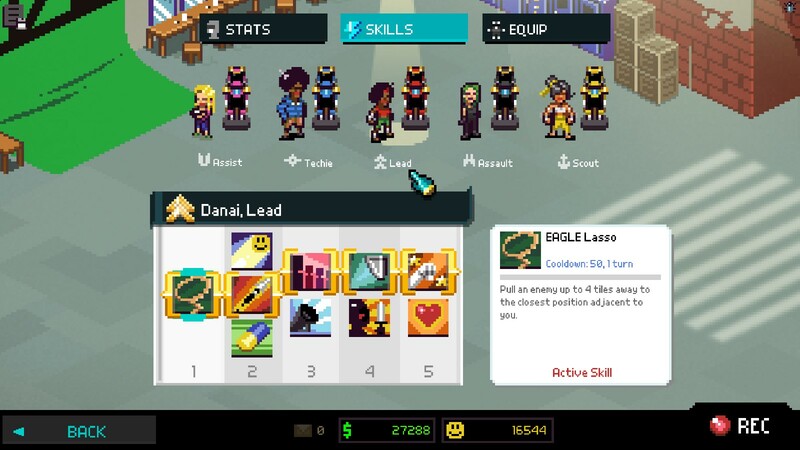 There’s plenty of challenge in choosing a set of abilities for your team that matches your playstyle, and experimentation is encouraged, since you can change abilities between every battle. The stats of your characters, meanwhile, are changed through equipment. Here again, important but enjoyable tradeoffs are present. 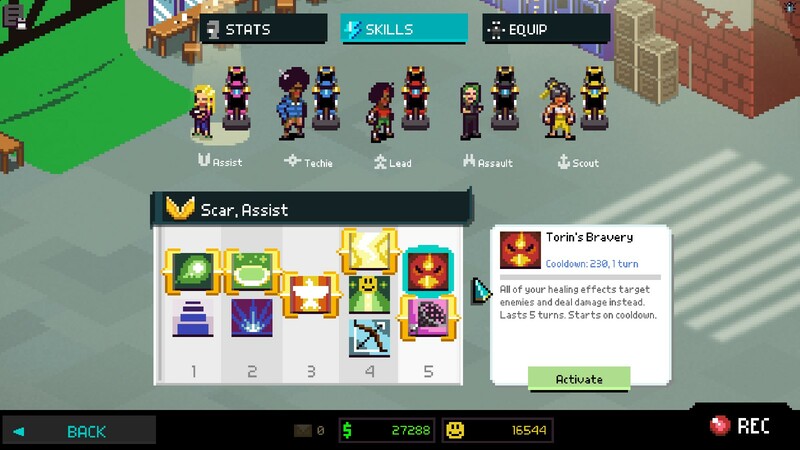 Do you go for skill regen so your characters can use special abilities and weapons more often, or go for straight attack damage so they always hit hard? More dodge, more counter chance, or more critical? Perhaps something special, like a greater movement range? There are excellent opportunities to synergize your team’s skills with their stats. To get equipment, you can either craft them yourself from drops you get during combat (which is free), or buy them at the shop. The shop offers a great alternative to crafting, especially if you don’t have the materials to do what you want, but can spare the cash. Another tradeoff is that you know exactly what you’re getting in terms of stats when you do buy an item, but crafting introduces quite a bit of chance. 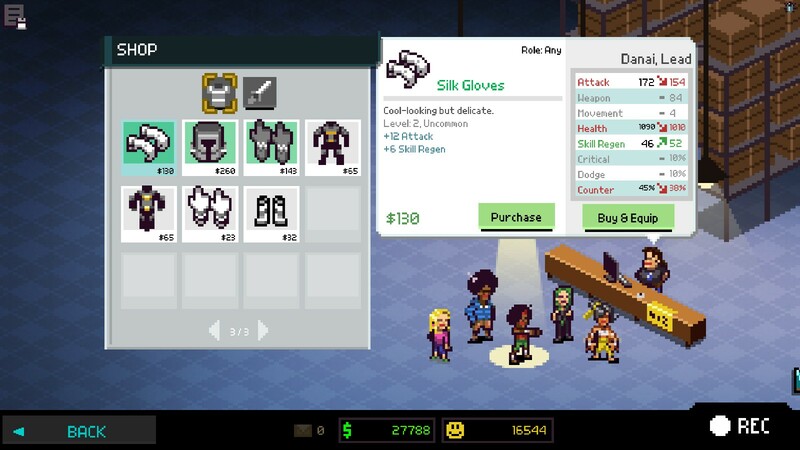 You may end up with an item better tailored to one of your characters, or an item that is a fine piece of equipment, but the shop-made stuff works just a little better. At least you can recycle equipment to get parts back. Every item also comes with a funny description, usually about how you’ve repurposed an existing item or ingeniously cobbled one together. Crafting items are also used to upgrade your mecha, for which the shop is of no help. Here you’ll use cardboard, wood, and a lot of duct tape to make an awesome, if blocky, combination robot and customize its stats and special abilities. Finally, you are running a business and trying to get as many fans as you can. So what’s a good business without marketing? You can choose from an ever-growing number of marketing agencies, each of which offers a different focus. 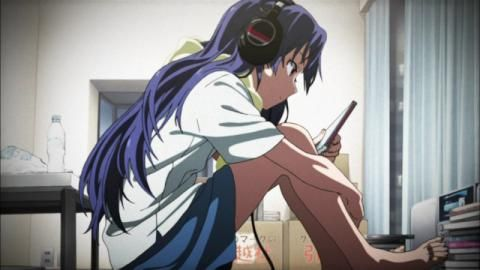 They offer stat boosts, either to your characters directly or to your organization as a whole, and the more fans you have (gained from successfully completing battles with style), the more boosts you can activate. 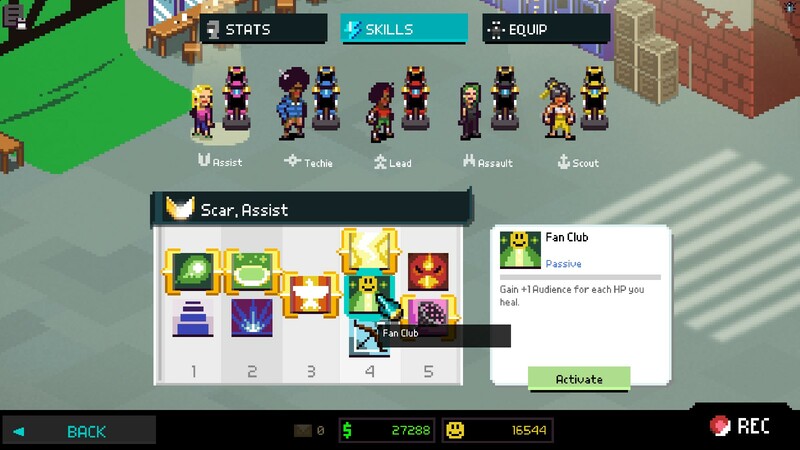 There’s a lot of long-term strategy here – do you build your fanbase (which feeds into ever-stronger boosts), go for money, get combat boosts, or go for other stats, like item drop rate or mecha improvements? Your “studio” can also be upgraded, if you’ve got the cash and are willing to take the hit to per-episode income. Every one of them is valuable, and each one is also visibly added to your studio, which is a nice touch. 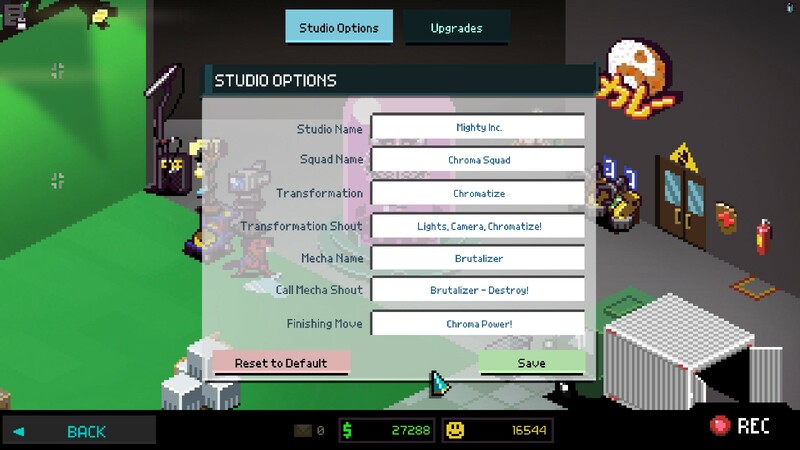 Finally, there’s the most important part of the whole studio experience – customizing your squad’s catchphrases! You can change these anytime, and the game works them into both plot dialogue and combat moves, giving you a real sense of ownership over the squad. I found myself yelling “Brutalizer – Destroy!” at the screen whenever it was time for a mecha throwdown. With all of this preparation, it would be awful if combat didn’t live up to the rest of the experience. Fortunately, combat is where everything you’ve been preparing for pays off. Every skill you’ve chosen has a dramatic effect, and the way you’ve built each character really shows itself on the battlefield. The battle mechanics themselves are what you’d expect from a tactical RPG, with the awesome addition of the Teamwork feature. 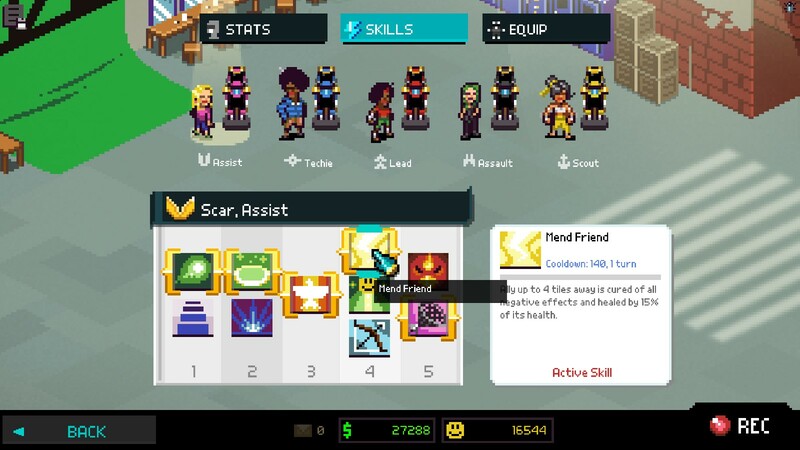 You can put any character into Teamwork mode, which ends their turn. They can then be used as a platform to catapult fellow team members to greater distances or, if they are near an enemy, to perform a combination attack. Get all five members together for a combination attack, and you unleash a supermove, best used for knocking out bosses. After some battles, it’s time for a mecha fight. Here, you take turns with the enemy. You can build up higher combos with each successful hit, which lowers the accuracy of the next hit while multiplying the damage, but a miss means it’s the enemy’s turn. It’s a great tradeoff, and some of the most tense battles were spent deciding whether to throw that next punch or use the combo I’d built up to go into defense mode. So, with all that praise, is there anything to say against the game? A few things, though none of them are really that bad. My biggest complaint is that the effects of different stats really aren’t well explained. While you can intuitively figure out dodge and attack, of course, “skill regen” isn’t immediately obvious and takes some play to get the hang of. 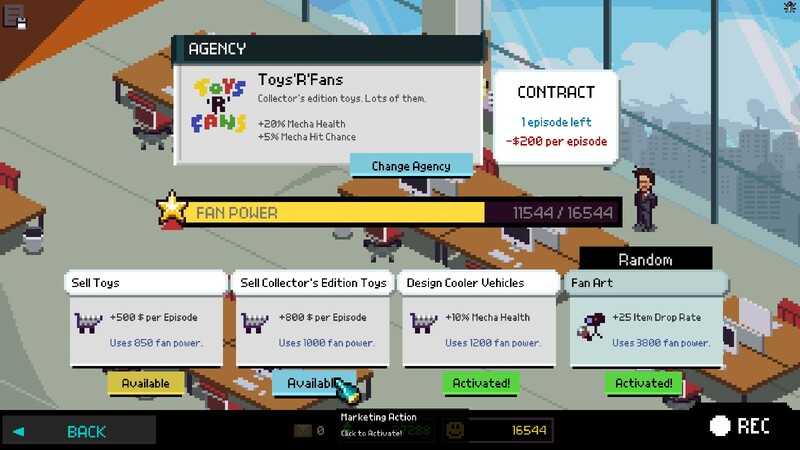 Organizational stats, like “fan conversion rate”, are similarly vague, and your total for these stats is not presented to you anywhere in the game’s interface. I’ve beaten the game and I still have no idea what “crafting rate” does – you can’t fail at crafting an item, and it doesn’t increase the chance of recovering materials while recycling. As for combat, it’s very solid, but in the last handful of battles, enemies that had been reduced to 0% dodge were still able to dodge attacks with disturbing frequency, so I’m not sure if there is a bug or what. Still, with only those quibbles to level against it, there’s nothing that’s really a deal breaker. 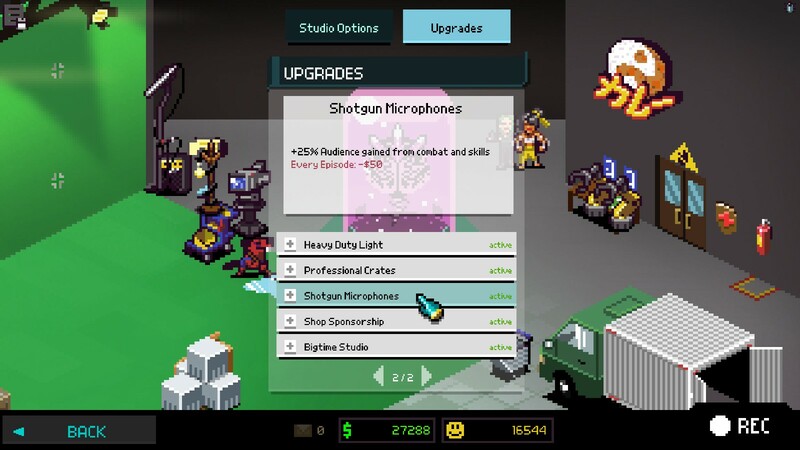 In short, with a good sense of humor, and a plot with familiar sentai elements that still feels unique, Chroma Squad is lots of fun to play and experience, while still managing to be challenging and mechanically sound. I wholeheartedly recommend it.